A wonderful garden plant, crocus bulbs are either autumn or spring flowering and can be used for naturalising into lawns in part shade. And with with so many species and cultivars crocus gardening is a large topic. Spring flowering species are wonderful for most gardens, they require little care and usually flower well before the lawn begins to grow. Growing well in cool climates they flower from autumn through to spring depending on species. 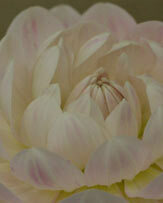 When you buy bulbs, they should be firm and show a good shoot if purchased in autumn for spring flowering varieties. You will find that the bulbs of some species are larger than others. Crocus vernus bulbs (pictured right) are one such variety. Generally the larger the bulb the better. Easy to grow, crocus bulbs can be planted at a depth of 7cm (3 inches) in small clumps - plant spring flowering crocus in Autumn. Crocus also grow well in pots or containers however remember to put the pots away in a cool shaded position during summer months. Crocus grow well in containers, at the front of the border or they can be naturalised into a lawn. Try a humus rich well drained soil in a sunny position. As for growing crocus plants in shade, you may get foliage, and flowers may form, however crocus flowers will not open in shade, so a sunny position please. Crocus are a genus of perennial flowering plants that grow from corms , The spice saffron is obtained from the stigmas of Crocus sativus. The name is derived from crocatus , meaning saffron yellow. 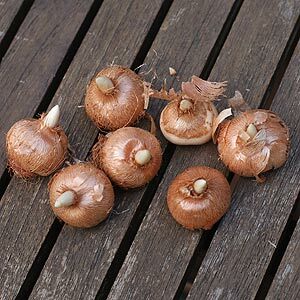 These are an excellent bulb for containers providing you do not neglect them. 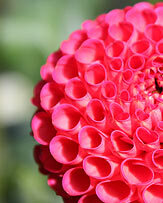 They require a good quality potting soil and a pot that is around 15 - 20cm (6 - 8 inches) deep. Good drainage is essential, and give bulbs around 3 cm ( 1 inch) between each one. You can use a layer of gravel or 'crock' in the bottom of the container if you wish. We tend to just check the drainage holes in winter and make sure the pots do not get to wet. Plant bulbs and firm in gently. Water in well with a liquid seaweed fertilizer and place the container in a sunny position. You will need to repot, and replenish the potting mix every 2 years. A quick review of crocus plant care. Major requirement for most species. Sunny position to partial light shade. 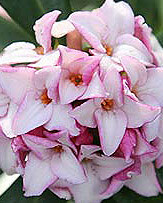 The spring flowering varieties should be planted in the autumn, the autumn varieties in spring. At the moment we are a little enthralled with Crocus roseus, it is one we have grown from seed and it is flowering for the first time for us. 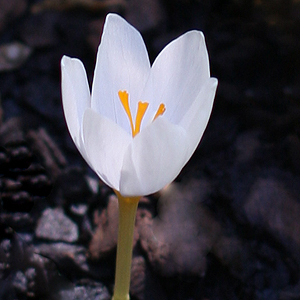 Crocus are a much varied genus and different species require different growing conditions. Crocus vernus is perhaps one of the easier species to start with, although many crocus are not overly difficult to grow. 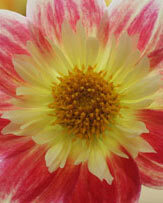 We provide a plant profile, growing notes and links to nurseries. Crocus - An extensive range of spring and autumn flowering crocus including specie and hybrids in a range of bright colours. 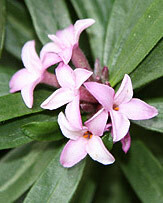 Spring flowering are normally at their best in late February. Mail order spring bulb specialists. Includes: Snowdrops, Bluebells, Iris, Cyclamen, crocus, fritillaria, narcissus, gladioli, and others.